Carbohydrate restriction and ketosis are the hallmarks of the ketogenic diet. Both confer various benefits and play a major role in the overall success of your new way of eating. Maintaining low carbohydrate intake is simple enough. All you really have to do is stick to a daily carb limit that allows you to get into and stay in ketosis. Knowing if you are in ketosis, on the other hand, can be a bit more confusing. Most of the time it is difficult to tell if you are actually burning ketones for fuel. The multitude of changes that take place while you are first starting the keto diet can cause a lot of confusion as to what is really going on inside your body. To make things much simpler, we decided to put together a quick guide that will help make the question “am I in ketosis?” much easier for you to answer. Ketosis is the metabolic state that the body enters when it needs to produce ketones for fuel because there is not enough sugar available. Technically, ketosis is reached when blood ketone levels are around 0.5 mmol/ L.
People will typically enter ketosis when they restrict carbohydrates (i.e., by following the ketogenic diet) or eat little to no calories (i.e., fasting for multiple days or restricting calories significantly). Depending on the person, their lifestyle, and the severity of their calorie and carb restriction, it can take anywhere from a day to a week and a half for someone to enter sustained ketosis. In general, the body will not enter ketosis as long as there are enough carbs available from the diet or stored glycogen (the storage form of sugar) to provide the cells with energy. As long as sugar is available (and you don’t consume exogenous ketones or medium chain triglycerides), your body will do just fine using glucose as its primary fuel source (with some help from fat). The one thing that sets the ketogenic diet apart from other diets is the fact that one of its primary goals is to get you into ketosis and sustain those ketone levels while you are dieting. This type of dietary approach can provide us many benefits such as increased fat loss, improved cognitive function, and reduced hunger (among others that we will explore later in this article). However, to experience the power of ketosis, our body will go through many changes. These changes may be unpleasant, but they will also provide us with signs that we are entering ketosis. The graphic below is a summary of some signs that may show that you’re in ketosis. 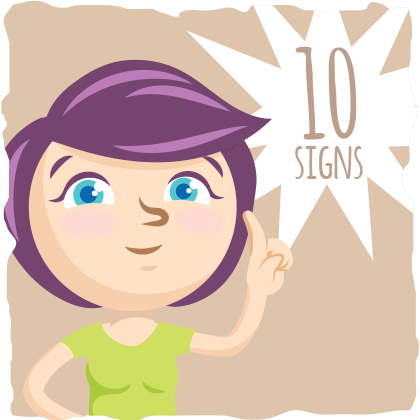 Scroll down below the graphic to see more detailed explanations (and possible solutions) to some of these signs. In the next part of this article, we will look at the major signs of ketosis. Keep in mind, however, that most of these will not clearly tell you if you are in ketosis or not — they are only signs. The most accurate way to see if you are in ketosis is by testing your blood with a blood ketone meter (which we will learn a bit more about later in the article). The combination of carb restriction and ketone production will cause your body to lose water at a rapid rate. If you are not drinking enough water during this process, you will typically have dry mouth and increased thirst. This is a good sign that will tell you if you are on track to ketosis, but as you notice these signs, make sure you increase your water intake. Don’t let the dry mouth or thirst linger too long. If you do, you may become dehydrated and experience a variety of unpleasant symptoms. To figure out exactly how much water you should drink while you are adapting to the ketogenic diet, follow the suggestions in this article. As your body is acclimating to ketone production, acetone will tend to spontaneously form. Since it can’t be used a fuel by our cells, we excrete it from the body in the urine and through our breath. This is why many keto dieters will have bad breath or “keto breath” that will sometimes smell sharp and pungent like overripe fruit or nail polish remover. Fortunately, the bad breath won’t last forever. As your body gets better at producing and using ketones, it will create much less acetone. In other words, if you stick with the keto diet, the smell of your breath will return to normal. Keep in mind, however, that having bad breath does not mean you are in ketosis. Keto breath is simply an indicator that you will soon be in ketosis if you continue doing what you are doing. Carbohydrate restriction and ketones are both natural diuretics. When you first start keto dieting, you may have more frequent bathroom trips as your body’s insulin levels decrease and you release more water and sodium as a result. After a couple of days, the bathroom trips may continue as you start to produce more ketones. This phenomenon is a pretty reliable sign that you will enter ketosis as long as you keep up with your keto diet. The ketogenic diet is one of the best diets for reducing hunger and causing people to eat fewer calories without realizing it. In many ways the keto diet is the perfect recipe for weight loss — it focuses on highly satiating whole foods like meat, fish, cheese, and low carb vegetables while also stimulating the body to use fuel sources (like ketones) that are more efficient than sugar. Once you are in ketosis, you are more likely to feel energized for longer periods of time between meals. You may even end up skipping a meal without realizing it because your body is having no problem with fueling itself on ketones, fat, and the sugar produced by gluconeogenesis. Don’t get me wrong, you won’t lose your appetite altogether, but it will take hours and hours before you start to feel that hungry feeling. You may also find that you naturally start eating smaller portions as well. This change in appetite can be caused by many reasons (i.e., eating more fiber and protein), but being in ketosis plays a major role in reducing hunger as well. When you are in ketosis, your body will be using more efficient energy sources than sugar (i.e., fat and ketones). With a higher availability of efficient fuel sources and an increased ability to use them, your body will require fewer calories to sustain itself. This translates to less hunger between meals and a reduced appetite. Constipation. You may go days without going to the bathroom due to the changes in mineral levels, hydration status, and fiber intake that are common with keto dieting. A simple solution may be to add low carb vegetables to each meal, drink plenty of water, and/or supplement with extra fiber, sodium, potassium, and magnesium if needed. Diarrhea. Both restricting your carb consumption and burning ketones for fuel can change how much water your body holds onto and excretes. The combination of limiting carbs and being in ketosis can indirectly lead to more water loss through your intestines which leads to diarrhea. No change at all. Ketosis doesn’t necessarily have to cause digestive issues. If you are still going regularly with normal stools, then keep doing what your doing. For those of you who are constipated or experience diarrhea during the first week of keto, this may be an indicator that you are in ketosis or on track to being in ketosis. If you only have one of these digestive issues without any other signs or symptoms in this article, then your issues are more so related to a lack of fiber, minerals, and/or water and not to increasing ketone levels. The good news is that this short-term fatigue indicates that your body is on the path to ketosis. As your body adapts to carb restriction and ketone burning, you will experience a sustained energy and clarity that you may have never experienced before keto dieting. To fend off the fatigue in the meantime, make sure you stay hydrated and consume plenty of electrolytes. For more specific recommendations, check out this article on how to remedy the keto flu. Insomnia or lack of sleep may be experienced when you are first adapting to keto dieting. You may find that you are struggling to fall asleep, waking up in the middle of the night, and/or not getting a full nights rest. On a biochemical level, this phenomenon occurs because carb restriction causes stress hormones to be elevated before ketone production is ramped up. This can disrupt your sleep cycle and make it more difficult to sleep. However, there is no need to worry — your sleep will return to normal (and might even get better) as your body becomes more and more keto adapted. Once your body starts burning more ketones for fuel, you will need less and less sugar and your energy levels will be more stable throughout the day. This may manifest itself as a newfound capacity to focus for extended periods of time or the ability to make it through the day with an afternoon coffee or nap. The efficiency of burning ketones and fat for fuel will be a saving grace for many of us who struggle to make it through the week. However, to experience this newfound mental clarity and endurance, our bodies need to start producing ketones consistently first. For some, this may take a couple of days of keto eating, while others may not get into ketosis until a week to a week and a half has passed. Once the liver starts pumping out ketones regularly, it may take another couple of weeks to months before you have reached your full ketone burning potential. In other words, when you first start keto, you may feel fatigued. Once you start producing ketones, the mental and physical fogginess will drift away and be replaced by more energy and mental clarity. After a couple of weeks to months, you will be a ketone burning machine, experiencing almost all of the perks of burning ketones for fuel to the fullest. Although ketosis is not necessary for weight loss to occur, losing weight rapidly while restricting carbs is still a good sign that you are on the path to ketosis. While you are on the ketogenic diet, you will typically lose a couple of pounds of water weight along with some fat in the first week. This shows you that your insulin levels are dropping significantly, setting your body up for ketone production. As long as you stick with your keto diet, you will probably enter ketosis by the end of the week while your body fat decreases at a slow and steady rate. If you want to learn more about how you can optimize your weight loss on the ketogenic diet, read through this article. For example, if you experience a couple of these symptoms, then you are almost certainly going to be in ketosis or are already in ketosis. Urine Stricks. This will answer the question “Am I in ketosis?” but will not provide an accurate measure of blood ketones. Breath Ketone Meters. These are much more accurate than the urine strips, but can sometimes vary in accuracy. Cheaper than blood testing strips in the long-run. Blood Ketone Meter. 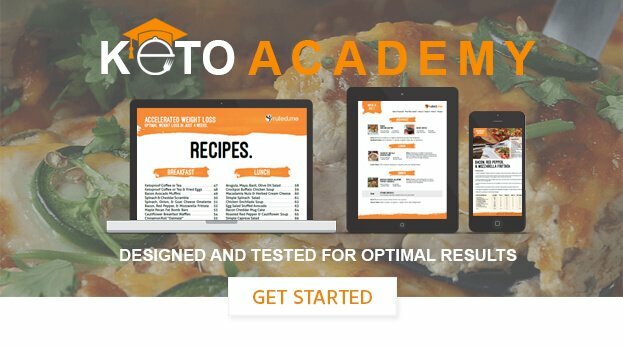 The most accurate keto measuring method available to the public, but the strips are extremely expensive. Most people will be in a light ketosis within two or three days of keto dieting so this would be a good time to test yourself using one of these methods. It is also important to know that it typically takes two to three weeks to get into a deep ketosis. Deep ketosis is ideal for weight loss and may confer some neurological benefits that extend beyond the benefits you’ll get while you are in light or medium ketosis. The only way for you to accurately find out if you are in deep ketosis is to use a blood ketone meter. However, don’t drive yourself crazy with ketone measurements. Your success will not be determined by getting the most accurate ketone readings. What matters most is following the ketogenic diet correctly by eating the right foods in the right macronutrient ratios for you. By doing this, you will be able to reap the benefits of the keto diet and ketosis. Ketones Stimulate Mitochondrial Production. New mitochondria are formed in cells after they begin burning more ketones for fuel. Why does this matter? Because more mitochondria means more energy and healthier cells. Ketosis Protects and Regenerates The Nervous System. Many studies have found that ketones help preserve the function of aging nerve cells and stimulate the regeneration of damaged and dysfunctional brain cells. For example, one study found that ketones helped patients with acute brain injury improve significantly. If you’d like to take a closer look at how ketosis benefits the brain, check out this article. Ketones Act Like an Antioxidant. Burning ketones for fuel reduces the number of reactive oxygen species and free radicals that are produced as a result of energy production. This helps protect the body from the damage and disease. Ketones Preserve Muscle Mass. When you lose muscle mass you lose vital years from your life. This is an unpleasant side effect of aging, however, a ketogenic diet may be the remedy. Many studies have found that ketones have a muscle preserving effect. This effect was especially prevalent in people who were restricting calories to lose weight. Not only does this make the ketogenic diet and ketones a great fat loss tool, but a longevity enhancer as well. Ketones Help Reduce Hunger. Studies indicate that burning ketones for fuel seems to act as an appetite suppressant. This may be linked to hormonal changes that ketosis makes to our hunger and satiety hormones or the fact that burning ketones for fuel is much more efficient (or both) — but the research doesn’t have a conclusive answer to why ketosis may cause you to eat fewer calories. Ketones Help Prevent Cancer Growth. Research shows that ketones can help fight cancer. This is due to the fact that most cancer cells cannot use ketones as fuel. Without adequate access to fuel, the cancer cells have no energy for growth, and the immune system will finally be able to eliminate them from the body. Every mechanism that explains these benefits has not been fully elucidated yet, and all of the benefits of burning ketones for fuel have yet to be discovered. Make sure you check back with us at Ruled.me for more updates as we uncover the newest research discoveries. If you’d like to learn more about our current understanding of ketones, check out our post on the topic. The only clear-cut way to know if you are in ketosis or not is if you use one of the ketone measuring devices that you will find in this article. However, investing in these instruments is not necessary for most people. With that being said, if you are losing weight, enjoying your ketogenic diet, and feeling healthier, then there is no need to obsess over your ketone levels. In this case, all you really need to do is keep calm and keto on!